Angra – Best Premium Shopify Themes is a multipurpose responsive theme with neat, clean, simple, creative and modern flat design. Angra is perfect for shopping business. It has amazing features that can increase the viewer’s attraction. It offers dynamic layouts and nice elements for your store. You can easily customize this theme that can surprise your potential customers. Moreover, with this advance section & Drag and Drop page builder gives your store looking nice. All the necessary features are here, there are four unique versions, 15+ Preloader, Valid HTML5 & CSS3, Bootstrap v3.x, 4+ unique slider, and Well Commented HTML & CSS files. It also includes Quick install, Notification Bar, Dropdown Menu, Featured Product, Ajax Cart, Multiple Banner, Brand Logo, Contact Map and much more. All the effective features create a dynamic platform to online shopping for any product. You may easily display your product catalogues on your store because enough premade pages are here. Angara – multipurpose eCommerce Shopify Premium Theme gives you promising offers who wants to run online business. This Cross-Browser Optimized theme is the best solution for any kind of eCommerce store. 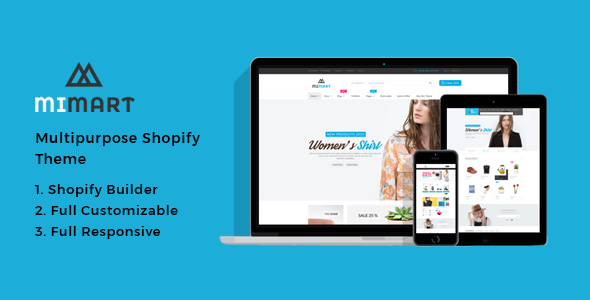 If you want to run your online business you can use this multipurpose Shopify theme. Anadi – Furniture Multipurpose Shopify Theme is an elegant, creative and modern theme. This stylish furniture theme has powerful Shopify page builder sections. With this minimal theme, you can bring an awesome look and feel to your web store. It is absolute for furniture, home decoration, design, appliances, and kitchen accessories and so on. Moreover, within a few moments it can be changed as per your own taste by including customizable home page layouts. Surely it has 4 unique pages along with 404 page. With this premium Shopify theme Anadi you will get plenty of elegant features option. It will assist you to create the perfect place to display your product and promote new products also. This responsive Shopify theme comes with Bootstarp 4, Valid HTML5 & CSS3, 3+ Unique Header style and slider, Quick Install, Drag and Drop, 7+ Unique Banner, Ajax cart, pagination. It also comes with Sections, Featured Product, Product Details, Contact Form, Contact Map, Contact Information, Google Fonts and others. Therefore, this Cross-browser Optimized & Well Documented multipurpose Anadi- Furniture eCommerce Shopify Theme is perfectly RTL supported. This furniture Shopify theme is completely responsive and well-arranged theme. 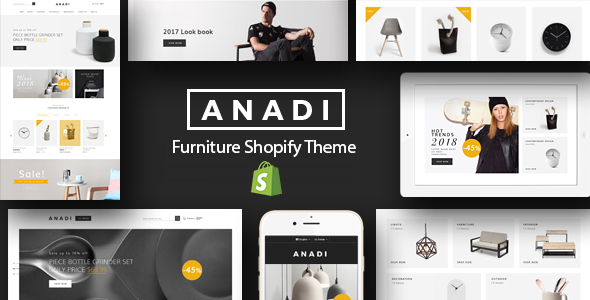 Enjoy Anadi- Furniture Shopify Theme, it will give you better experience for better performance. Bigon – Multipurpose Electronics Shopify Theme is perfect for all kinds of online business. This responsive Shopify theme is a neat, clean & flat design. This minimal Shopify theme makes your store look awesome on devices; it does no matter what kind of business you run. It may use different sections like Computer, Tablet, Smart Phone, Kitchen, Electronics and much more. You can change and customize this theme as your wish. No matter you can smoothly run on your web store in your own way. Bigon is an outstanding electronics Shopify theme which is built from strong powerful sections, using drag, drop page builder. Bootstrap 3 Bigon has quick installation. This eCommerce theme has nice and elegant features. All the significant features are very effective which may assist you to run your online business. There are 4 unique home pages along with several pages also. 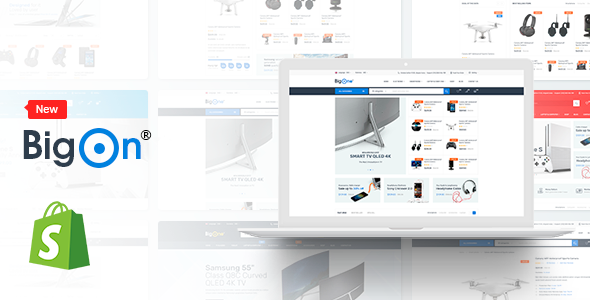 Finally, the Bigon Electronics Shopify eCommerce Theme gives you a dynamic chance to run your online business. This Cross- browser theme must help you to set up your online web. It also helps you to reach your goal. 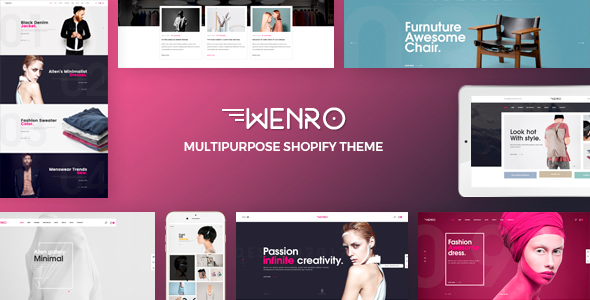 Wenro – Multipurpose Shopify Theme is an excellent eCommerce responsive Shopify theme. It is absolute for different kind of online business. Wenro has elegant, neat and clean design. Its creative design also attracts the viewers’ attention. This eye-catching theme may be perfect for your web store. With this responsive theme you can smoothly run your business without any hesitation. This Shopify Theme is perfect for Books, Watch, Hand Made, Sports, Jewelry, Flower, Electronics, Furniture and many more. Moreover, Wenro the Bootstrap 4 Shopify theme is built-in Shopify Sections by using Drag & Drop Page Builder. If you choose this creative theme for your online business Wenro may be the best solution for you. All the necessary features are present here. Every feature is very unique and effective for online business. Wenro comes with using Drag and Drop page builder, sections, 28+ Home Version, Quick Install, Multiple currency, 40+ Sections, Related Product, Featured Product, 15+ Banner, 15+ Preloader, Contact Map and many more. This Cross- browser optimized premium Shopify theme Wenro offers a lot of dynamic options which can help you to run on online business. This well documented theme   also ensures you may use it comfortably. Dilan – another quality item in the Best Premium Shopify Themes is built with fantastic design with awesome layouts. Its design is very simple, clean & flat. This responsive eCommerce Fashion Shopify theme is dedicated for Furniture, Accessories, Fashion and other related eCommerce products. You may apply this multipurpose Shopify theme on your store in vivid way. You can smoothly use this theme on your store without any difficulty. This customizable theme can be changed as your own wish. Dilan – Shopify theme has a bounce of amazing features which are good looking and attractive. So, visitors can easily be tempted to set this theme on their online store without any thinking. All the necessary features are here. There are 4+ Home Versions along with one RTL version, several inner pages, Quick Install, Shopify Builder, Unlimited Color Options, Notification Bar, and Drop-down Menu, Mega Menu with Image, Full Screen Slider, Featured Product, and Banner. It also includes Ajax Cart, Quick View, and Unique Tab for Each Product, Product Video Tab, Custom Tab, 15+ Preloader, Google Map and more. 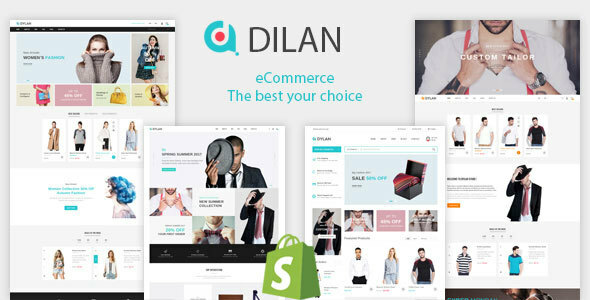 Be ready to run your online business with Dilan – Fashion ecommerce Shopify Theme. This cross- browser compatible theme assists you to spread your online store. So, stay with this well documented theme. Arubic – Responsive Shopify Theme is an eCommerce well organized theme with outstanding layouts and flexible design. This responsive theme creates a new platform for online business. You may easily run your business on your web store in different way. This eCommerce theme helps you to display your product as your own desire. This modern Shopify theme is perfect for various kinds of business like - Fashion, Costume, Clothing, Accessories and Beauty related products. 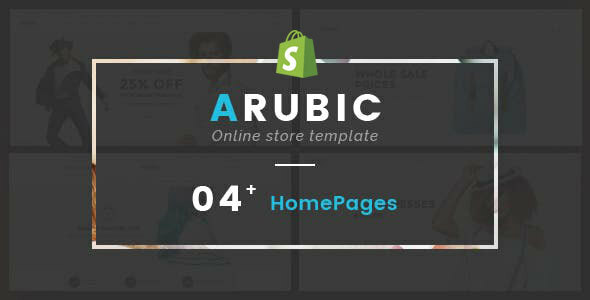 Arubic – Responsive Shopify Theme gives you numerous offers which are eye catchy and SEO friendly. This minimal theme has amazing features which can give you chance to start an online business on your store. Basically, this theme is built with Shopify Builder along with awesome layouts. It has 4+ Home pages along with several inner pages, 18+ Sections, 15+ Preloader, Quick install, Shopify Builder, Theme color Options, Notification Bar, Slider, Single Banner, Multiple Banner, Featured Product, Product with Carousel, Product review, Related product, Testimonial, Custom Tab. It also includes Custom Tab, Shortcodes, About Information, Ajax Wishlist, Brand Logo, Services and more. So, Arubic Responsive Shopify Theme is easy to customize. This Cross-Browser Optimization theme may be the best options on your store. Get ready to set up this theme on your store. 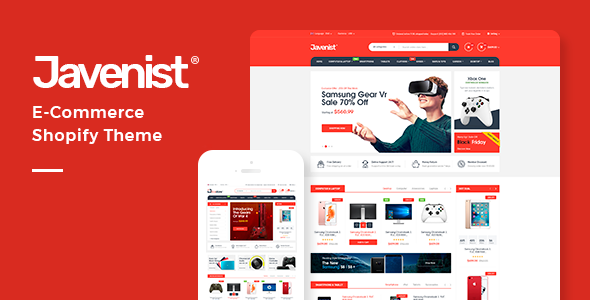 Javenist – eCommerce Shopify Theme is a responsive eCommerce Shopify theme for online business owner who want to set up online business and sell their products. This clean and minimal Shopify theme looks fantastic on your mobile and desktop devices. You can set your products in your own desire. This Shopify theme gives you nice options which may display your products on your store very nicely. On top of that this theme is looking great for its smooth design. This awesome design based on different layouts as well as Shopify builder. Moreover, Javenist – eCommerce Shopify Theme has outstanding features which are neat, clean and eye catchy. This responsive Shopify theme comes with 7+ Home pages along with several inner pages, 7+ Header Styles, 13+ Sections, 4+ Unique Slider, 5+ Unique Banner, Quick View, Shop Grid/List View, Latest Blog, Contact Information, Contact Form, Google Analytics, 15+ Preloader, and Shortcodes, Theme Color Options, Breadcrumb Banner, Newsletter Popup, Ajax Cart, Wishlist, Drop-down Menu, Mega Menu, Mega Menu with Image and much more. So, this cross-browser compatible theme Javenist – eCommerce Shopify Theme is fully responsive and well documented. Undoubtedly, this theme is easy to customize that’s why you can set up this theme on your online store without any thinking. Try this Javenist – one of the Best Premium Shopify Themes now! 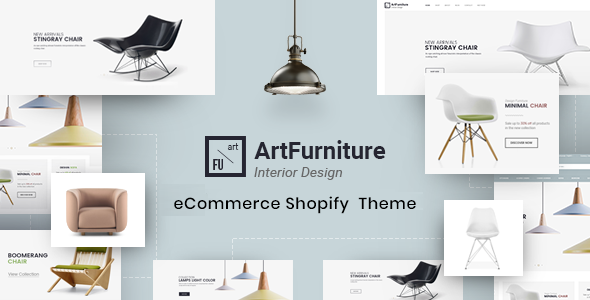 Art – Furniture – Furniture Shopify Theme is a responsive multipurpose eCommerce Shopify theme. This theme is nice looking for its awesome layouts. Its design is also simple, neat & clean. You can easily change the elements as your own desire and convert into a perfectly different store. This theme will help you to start a new online business. You may display your product on your store in different way. This Shopify theme is perfect for furniture, home decoration, design, appliances, kitchen, and accessories and so on. Moreover, there are plenty of amazing features like 4+ Home Versions along with several inner pages, 4+ Header, 4+ Slider, Drag & Drop One Click Install, Sections, Dropdown Menu, Notification Bar, Mega Menu, Sticky Header Mega Menu With Image, Currency and it also includes Multiple Banner, Featured Product, , Ajax Cart, Tab With Product, Masonry, Featured Product with carousel, Related product Collection Tab, Product, Product review, , Contact Form, Built Based on Bootstrap v3.x, Valid HTML5 & CSS3, Contact map (Google map API). This responsive RTL supported Furniture Shopify Theme gives you plenty of options which is perfect for online business. So, don’t delay; try this cross browser and well documented eCommerce Shopify theme without any thinking. Mimart – Shopify Theme is an outstanding eCommerce web site. It has a bounce of amazing features which are elegant as well as smooth. This responsive Shopify theme is neat, clean, simple and modern flat design. This ecommerce theme will help you to showcase your product in different way. It also fulfills your demand. You can easily run your business by using this minimal theme on your store. This Shopify theme is perfect for a stylish and elegant store. However, the Mimart – Shopify Theme offers 4+ Home Versions, 4+ Header Options, 3+ Unique sliders, 3+ Unique Banner, 15+ Preeloader, Built Based on Bootstrap v3.x, Well Commented HTML & CSS files, Quick Install, Dropdown Menu, Sections, Ajax Cart, Drag & Drop, Currency, Notification Bar, Simple Product, Featured Product, Tab with Product, Quick View, Services, Brand Logo, Banner, Unlimited Custom Tab. It also includes Facebook comment, Post Archive, Shortcodes, Google Analytics, Google Fonts & Material Icon Font and much more. This cross-browser Shopify theme is fully responsive and SEO friendly and it will help you adjusting this multipurpose eCommerce Shopify theme as you want. This well documented theme gives you all time support whenever you need any help. So, start the online business with this Mimart eCommerce Shopify theme without any doubt. Jhilmil – Responsive Shopify Theme is perfect for online business because it has outstanding design as well as awesome layouts. By using Drag and Drop this theme looks elegant. It will help you to display your products in your own desire. You will get all the categories for setting up a new online business. This Shopify theme is perfect for selling, fashion, men fashion, women fashion, digital, kids, watches, shoes, sports, furniture, accessories, clothing, flower, jewelry, cookery and many more. Moreover, All the necessary features are available here which are the most important to start a new online business. You will get all options as your demand. Jhilmil offers numerous significant features like – Built Based on Bootstrap v3.3x, Well Commented in all files, Font awesome icon, Quick Support, Neat, clean and simple design, Free updates, Cross Browser Optimization, Ajax Cart, Ajax Cart, Unlimited Color Variation. It also includes 19 Preloader Style, 5 Product Short Code, SEO friendly, Facebook like box, Product Description Tab, Product Rating & Review, Available Inventory, Google Map and much more. So, this eCommerce Shopify theme Jhilmil is surely perfect for online business. If you start a new business you can set up this theme immediately without further thinking. In this article you will get the latest information as you feel. Definitely, it will change your mind. 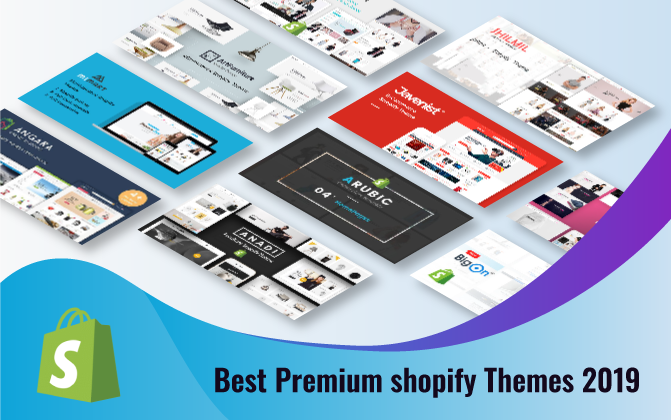 Now you can enjoy the test of the best Premium Shopify Themes.